Next month Marvel Comics is releasing a new application that will add augmented reality content to some of its comic books, the company announced on Sunday at the SXSW Interactive conference in Austin, Texas. Augmented reality allows computer-generated content to be superimposed over a live camera view of the real world. 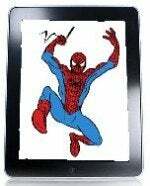 There are different ways to do this but the technology Marvel will use relies on image detection, and has been developed by Aurasma. The necessary Marvel AR app will be released in April for Apple's iPhones and iPad as well as smartphones and tablets, the comic book publisher said in a statement. By opening the application and holding the device in front of compatible comic book page, users will able to unlock free extra content including new footage and commentary from creators, according to Marvel. Compatible comic book pages will be tagged with an AR logo, and the augmented reality content will be included with titles such as Iron Man, Thor, Captain America, Spider-Man, Wolverine and Hulk, Marvel said. North American comic book sales have had ups and downs in the last decade. Last year, 72.1 million comic books were sold, a step up from the 69.2 million copies sold in 2010. That's still not close to the 85.3 million copies sold in 2007, according to data from Comics Chronicles. Marvel made an early foray into putting comics on mobile devices in 2009. It recently announced plans to publish graphic novels as Apple iBooks. The comic book hasn't changed much, but augmented reality will expand the reading experience and add more value, according to Marvel.